The roots of Monaco Coach Corporation run back to 1968 with the formation of Caribou Coach Corporation. They soon evolved into Monaco Motorhomes, Inc., and out of that organization Monaco Coach Corporation was born in 1987. In 2009, Monaco was purchased by Navistar. Their $47 million deal completed the transaction of acquiring existing inventory, intellectual property, and production facilities located at Monaco’s headquarters in Coburg, Ore., as well as Harrisburg, Ore., Wakarusa, Ind., and Milford, Ind. 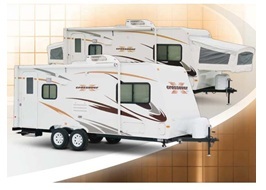 The company plans to continue producing towables and retain certain finance and information systems operations in Oregon, as well as maintain a RV service center there. R-Vision’s light weight trailer lines include: Crossover which has six floorplans to choose from and the Trail Sport with fifteen floorplans. Two of the Trail Sport models are expandable or hybrid travel trailers. 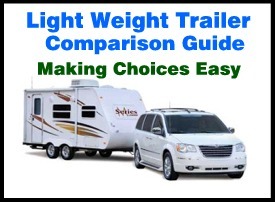 Our Travel Trailer Comparison Guide will help you to decide which manufacturer is right for you. With so many different models and RV manufacturers how can you tell which are quality built trailers. Our guide rates the factories of the trailer industry over model years 2006-2013. Looking at construction, customer service and how the dealers rate them as well as resale value will give you the information you need to make an informed buying decision. Order your buying guide today.